La Traviata will be making a welcome return to the Teatru Astra twenty-one years after it was presented for the first time in April 1989. This time round, Teatru Astra will present two productions of Verdi's perennially fresh opera which, alongside Puccini's La Bohème is surely one of the best-loved in the canon. This year marks the ninth edition of Festival Mediterranea, a yearly extravaganza of music, culture and history that has become one of the most anticipated cultural events on the islands. 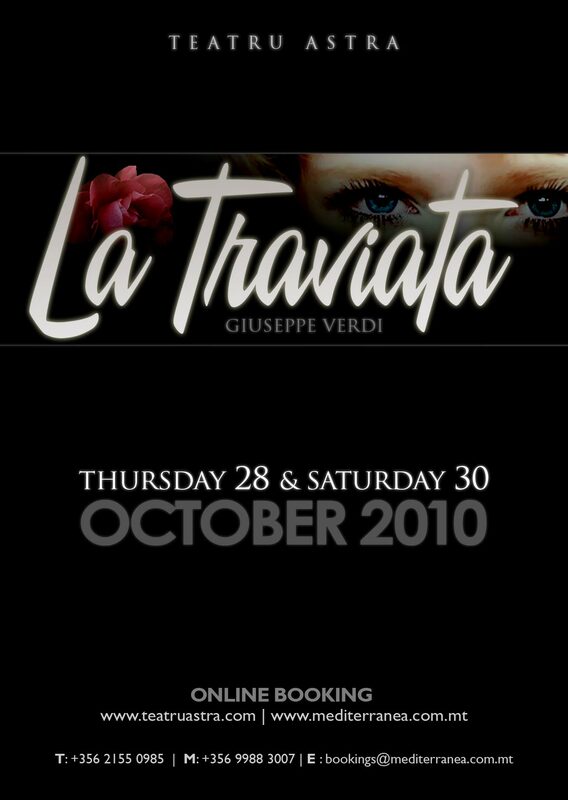 La Traviata will have its first performance on Thursday 28th October whilst the second production is set for Saturday 30th October 2010. Based on Alexandre Dumas novel La Dame aux Camelias, La Traviata was composed in 1852, during one of Verdi's most prolific period which also saw the great maestro pen his wonderful Il Trovatore and Rigoletto. With Miriam Cauchi as Violetta in the leading role in La Traviata, the production augurs great anticipation and a guarantee for success after her resounding triumph as Gilda last year in Rigoletto. Ms Cauchi is the leading opera soprano on the islands whose versatility and stage presence have won over critics and audiences, both in Malta and abroad. Alessandro Liberatore, an Italian tenor whose bel canto style has been described as emulating the great tenors of a glorious past age, will sing the role of Alfredo, whilst the part of Germont will be interpreted by Marco Chingari. Chingari will be making a most welcome return to Teatru Astra after wonderful performances in the title roles of Macbeth, Iago in Otello and Scarpia in Tosca. These leading roles will be supported Georgina Gauci in the role of Flora and Dorienne Portelli in that of Annina. Both Ms Gauci and Ms Portelli have acquitted themselves admirably in minor roles at Teatru Astra in previous opera productions. Frans Mangion will sing Gaston. Festival musical director and conductor at the Teatru Astra, Prof Joseph Vella, is celebrating his fortieth year in this role. With his reputation and experience in the operatic field, having guided Teatru Astra to the top echelons of musical excellence, establishing the theatre as one of the top venues for such productions, Prof Vella will once again conduct the Malta Philharmonic Orchestra (leader: Marcelline Agius) for the performances of La Traviata. As has been the case for the past 23 years, Maria Frendo will be in charge of the Teatru Astra Opera Chorus which is constituted of the best elements on the islands, including that of the well-known Laudate Pueri Choir, together with a strong male participation from members of the Teatro dell'Opera, Roma. This new production will be under the artistic direction of renowned Marco Gandini, whose productions in the major venues in Italy, including La Scala and Teatro dell'Opera, Roma have won him rave reviews. The design of the set is the hands of Mauro Tinti. Joseph Cauchi is scenic artist and Carmel Zammit Stage Manager. Costumes will be in the hands of Lucal Canfora, Emanuel Grima and George Farrugia.